Badnoise is a music streaming platform developed for my Mobile Web Application module at Brunel. 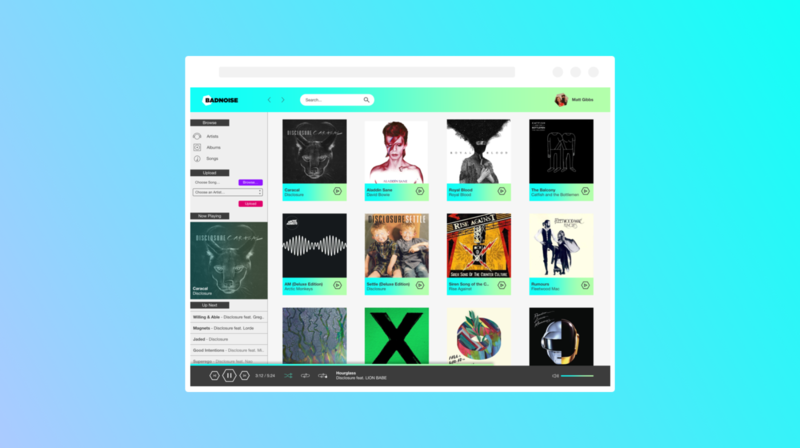 The brief for this project was to create a music streaming service, which had Login/Logout features, two tiers of users, each of whom would have access to different features, a file upload facility, as well as the ability to add and remove artists, and songs. The process I went through to create Badnoise was relatively straightforward. Firstly, I created designs in Sketch, which helped me visualise the layout of the application, and all of its various features. After this, I created a responsive HTML and CSS site. I tested this along with all the relevant jQuery interactive features across all screen sizes I could, using the browser viewport, and other devices which had touchscreens. Finally came time to set up the SQL database and create the interaction between the application and the database. We were provided a database creation script, which only had to run on localhost. Using PHP scripts initiated by jQuery requests, I returned JSON arrays which were received and echoed to the browser.